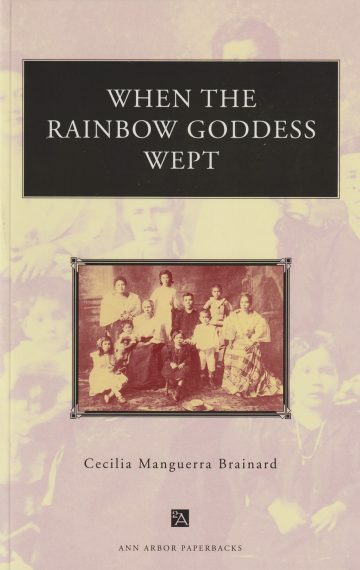 When the Rain­bow God­dess Wept is Cecilia’s acclaimed first nov­el about a com­ing age of a young girl in the Philip­pines dur­ing World War Two. First pub­lished in the Philip­pines as Song of Yvonne, it was picked up by Dutton/Penguin in 1994. A Plume paper­back edi­tion was pub­lished in 1995. A Turk­ish Edi­tion, Gokkusa­gi Tan­ri­c­asi Aglad­i­gun­da (trans­lat­ed by Fusun Talay), was pub­lished by Bilge Kul­tur Sanat in 2001. The US edi­tion of When the Rain­bow God­dess Wept is cur­rent­ly pub­lished by the Uni­ver­si­ty of Michi­gan Press, and the Philip­pine edi­tion is forth­com­ing by The Uni­ver­si­ty of San­to Tomas Pub­lish­ing House.